With organic reach plummeting, brands are left to rethink their paid strategies. In fact, 71% of the most successful content marketers use paid methods to distribute content on channels like social media. But even the most experienced marketers face challenges. CMI is no exception. We want better performing social media ads. Like you, we’re navigating the paid waters. How does each platform work? What ad type and content format will maximize spend? 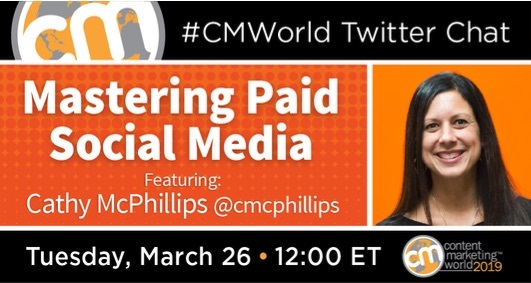 On this week’s CMWorld Twitter chat, Vice President of Marketing Cathy McPhillips shared CMI’s approach to social media advertising. In addition, our community gave us their tips and advice. Do you boost organic posts or create ads? Or both? What benefits do you see to these, and what’s working better for you? Do you just use the same creative from Facebook for your paid ads? What works better for you here – photos or videos? And what types? What’s your strategy? Do you use paid Twitter to increase awareness for a particular tweet, get new followers, website visitors, or just increase engagement? Facebook ads always performed better, and far more affordable. We didn’t even bother with Twitter ads. How has sponsored content worked for you? Do you ever mix this in with text ads? If so, why? Cost efficiencies, higher impressions? What benefits do LinkedIn paid ads have over other platforms? What has been your experience with paid social ads? Are you finding success? Let us know in the comments below. Did you know we have a dedicated social media track at Content Marketing World? Join us in Cleveland to hear from experts like Viveka von Rosen, Tim Schmoyer, and Wally Koval. Register now with code SM100 to save $100 off Early Bird prices.